Trained by Imogen Cooper, Abigail has worked with Golden Egg for over five years managing the office and developing her editorial role. 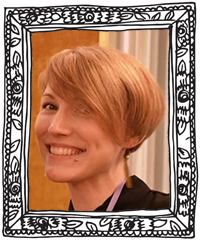 Since graduating from the Golden Egg Editors’ Course in 2016, a number of the writers she has worked with have been agented – one with a publishing deal soon to be announced! Before Golden Egg, Abigail was Assistant Manager at a vibrant independent bookshop, where she ran the children’s section. She previously also held internships at Walker Books, David Fickling Books and Chicken House Publishing.